Sort of Meat Pie but with Potatoes. 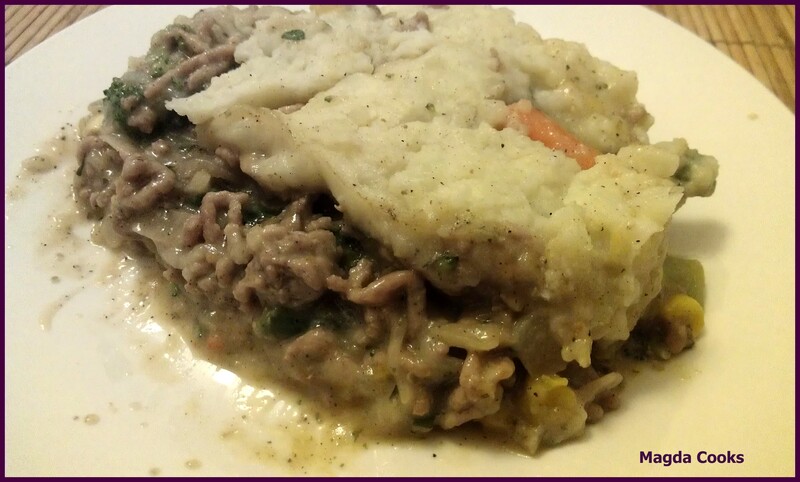 You could easily make this with pastry crust and it would be like a ground beef pot pie… sort of. Anyway, we like a lot of vegetables and I try to utilise as many as I can, when I am called upon to do the “dirty” no, not that, NOR, washing the dishes… but when Magda Cooks, doesn't cook and Cookies gets to cook. More like IS MADE too, but I like too as well, as generally, by rule, I do stuff she does not. Henceforth, good. Todays recipe is an easy one, not much goes into this, and can be done a number of different ways actually. I will present to you, the way I do it, but I will also try to show you some alternatives too. Basically its potatoes with mixed vegetables, and a gravy sauce from ground beef. Sounds easy? Well, guess what IT IS. First off, prepare your fresh vegetables, that consisting of the onions, and pepper at minimum, or if you use them fresh, the carrot, parsley root, and celery... plus any additional as listed above. Cut them so they will cook in the mix, yet not end up “missing in the mix”. Place aside. Take the chopped onion, pepper, (if others) and toss them into a pot with high sides, not a gigantic one, but a decent sized one. Toss in a little margarine or butter to gently saute them. Do this for about 3 to 4 minutes (again, depends on the actual amount of vegs you add to this)... the more vegs cook accordingly. But not to make them soft of course. Add the ground beef and brown it. Add salt, pepper to taste. And if you like garlic powder, basil, thyme and oregano go good with this as well, but in moderation. Do not let them overpower it. While that is underway, peel your potatoes, cut them and gently salt, and start boiling them. The idea is to climax both around the same time. However you may use instant potatoes and do it earlier... there will be no real difference. Just make sure you MAKE enough. As the ground beef mixture browns, and cooks, if you have additional frozen vegs to add or canned its TIME to add them. Cook it til the frozen vegs or others are now edible. Meaning cooked. Now if you have the potatoes boiling, time to make mashed potatoes. I don't have to tell you how to do it, but do it as you usually do. At this point, you should have the ground beef and vegs mix cooked and done, and the potatoes done. Now time to prepare the gravy sauce. As I said you can use either bagged gravy or be brave and create your own. At this point I tend to do it by eye, based on size of the created content. What I do is, I mix 2 tablespoons of flour with about 200 ml of milk. You may also use cold water. I then mix it together, and add some additional liquid, up to another 100 ml and pour them into the mix together. I then stir this all together over medium heat to create a gravy like consistency. You may have to add more or less depending on your serving amounts. But this is about right. You can toss in a beef bouillon cube or the instant bouillon if you want to give it extra beefy taste. If so, please be aware it may end up overly salty, use caution. At this point you cook it till the gravy mix thickens up to your liking, and then you add the mashed potatoes on top to form what should be a crust. Completely and totally cover it. Press it down and make it flat, and you can either toss it back onto to the stove for a few minutes (watch it the bottom will burn so use low heat) or into a preheated at 180 F oven for about 5 to 7 minutes to brown it up nicely. 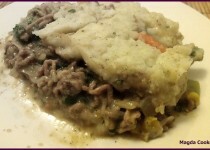 You can also place the beef mixture into a casserole dish, and do the potatoes on the BOTTOM and TOP and place it into the oven for about 10 to 15 minutes, until golden brown, also at 180 F.
Once either method is done, let it sit for about 10-15 minutes so the ingredients can sit and you can serve it lasagna style, if you use the casserole dish, it would be much more equal to a lasagna meal, than the pot version will be. You can have a variety of small salads with this, or breadsticks, or just nothing. It works all around equally well. Serve hot. Pro Tip: The more vegetables you add the more tasty it actually becomes.